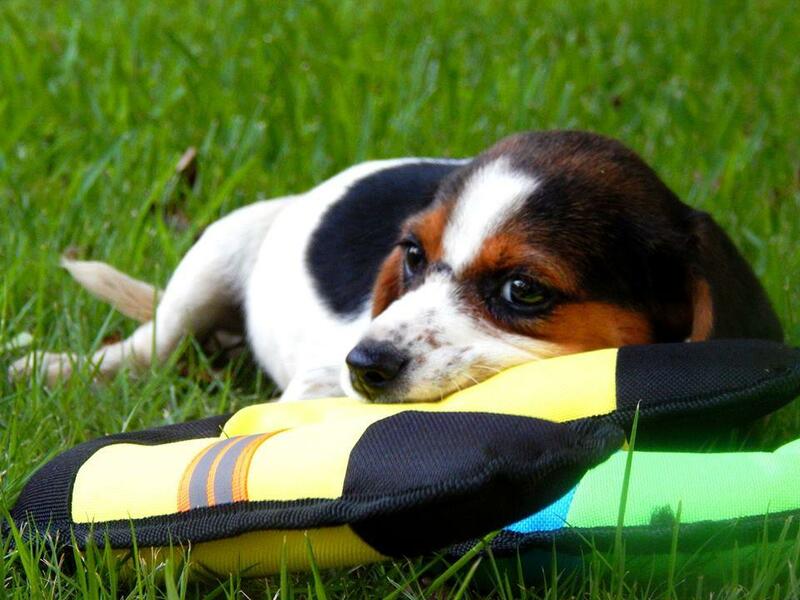 10 week old beagle mix Millie came to Releash Atlanta with her littermates Fergie (black and white) and Tadpole (Polly)(tri-color mostly black) and a sad tale. She and her sisters were underweight, covered with ticks and loaded with internal parasites. That's okay though- the girls loved their medicine, and little Millie, who is the leader of this pediatric pack, would find the medicine bottle and bring it to her foster mom when it was time for a dose! She's a smart and spirited girl who is balanced between puppy play and snuggles with her foster family. She is very forward and intent on making friends with the other pets in the house on her own terms, so supervision with adult pets would be recommended. She is spayed, chipped, and has all age-appropriate shots, She is a puppy so a family who is interested in raising and training a young dog would be a great fit. Beagles are wonderful pets, but they do require a lot of attention and supervision, especially when playing outdoors!